Halo: Reach's success proves the industry is in a healthy state, says Microsoft exec. Bungie's final Halo game before it ships out to work with Activision has come out of the gate strong. According to Microsoft Game Studios vice president Phil Spencer, Reach made $200 million dollars in its first 24 hours, making it the biggest entertainment launch of the year. Spencer blamed the industry slowdown on a lack of blockbuster titles over the last year, and said that Reach's numbers proved that gamers were still willing to spend their money for games they really wanted. He said that Reach had already surpassed Halo 3 in terms of online players and would drive hardware sales. 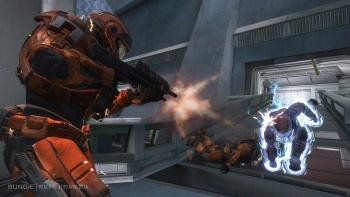 "We feel really good about where the Halo: Reach numbers are," he said, What [they] tell me is [that] gamers are there. They are willing to buy the great experiences when they come out. In fact, that we are exceeding Halo 3 numbers out of the gate tells me that the industry is in a healthy state." Of course, with Spencer calling Reach the biggest launch of the year, comparisons to Call of Duty: Modern Warfare 2 record-breaking release last year are inevitable. If figures reported at the time are to be believed, MW2 sold around 7 million copies on its first day, which is more than $400 million dollars in revenue, assuming a cost of $60 per copy. Clearly, Reach hasn't snatched the record, but first day sales aren't everything, and Reach will undoubtedly continue to sell well for a considerable length of time.